Would You Like To Become More Involved With ILFA? Perhaps you could do a once-off fundraising event such as a coffee morning or maybe you would be interested in setting up a local ILFA support group where you live. You can decide what level of involvement you would like to have. If you are interested in getting more involved, ILFA would like to hear from you. 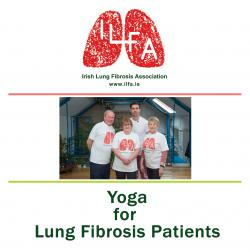 ILFA’s patron, Michael Darragh Macauley, Dublin GAA footballer and yoga instructor, kindly helped us produce a yoga exercise DVD for people with lung fibrosis. Yoga can provide health benefits to people with lung fibrosis through improved breathing, relaxation, and improvements in mobility and flexibility. There are two levels of exercises featured which are suitable for beginners and those who feel they can progress to a more advanced stage. You can watch the video online here, on ILFA’s YouTube channel and you can order your own copy from ILFA. Please call 086 871 5264 or email info@ilfa to order a DVD. This patient resource has been made possible with the kind support of Three Lakes Partners. Sincere thanks to Michael Darragh Macauley, Matt Cullen, Pamela Martin and Evelyn Cooper for taking part in the Yoga DVD. We hope you enjoy this new patient resource. The IRISH LUNG FIBROSIS ASSOCIATION was founded in 2002. The Irish Lung Fibrosis Association was set up in 2002 to support patients and families living with idiopathic pulmonary fibrosis (IPF). IPF is a progressive lung condition where fibrosis or scarring causes the alveoli (air sacs) in the lungs to thicken and harden. The fibrosis or scarring interfers with the normal transfer of oxygen from the alveoli to the blood stream and results in low oxygen levels in the blood and shortness of breath. The word 'Idiopathic' means 'unknown' - the cause for IPF has not been identified yet. It is estimated that approximatley 400 patients are diagnosed with IPF in Ireland every year and approximately 1000 patients are living with the condition. Please click here to visit our News and Events section which contains all the latest news and stories from ILFA. Please click here to visit our Facebook page. 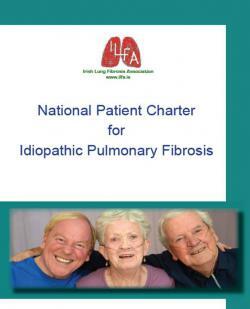 ILFA developed the National Patient Charter to support IPF patients and their families, empower them to look for best treatment and give them a clear expectation of the standard of care they should receive. The charter was developed with the input of IPF patients and carers, health care professionals and professional respiratory organisations. The National Patient Charter for IPF identifies six key areas needed to ensure IPF patients get the best level of care. 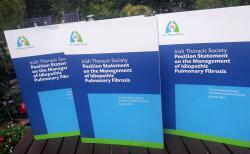 Please click here to read the 2018 Position Statement from the Irish Thoracic Society (ITS) on the Management of IPF that was launched on 31st August 2018 at the Royal College of Physicians of Ireland. Click on the link above to visit our patient information resource page. Alternatively click on the titles below to download the leaflets, email info@ilfa.ie or call 086 871 5264 to request a Patient Information Pack with all of our printed materials. 1) What is Pulmonary Fibrosis? 11) ILFA Join us! Get involved! In 2017, ILFA celebrated our 15th anniversary. 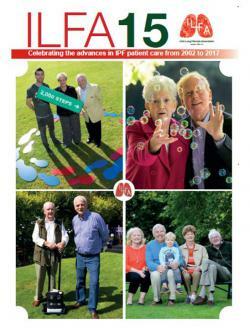 The production of the 'ILFA 15' magazine was a major project for 2017 and celebrates the advances in IPF care since 2002, when ILFA Ireland was founded. The magazine has articles written by patients, doctors, nurses, allied healthcare professionals, clergy, patrons, professional respiratory bodies including the Irish Thoracic Society and The European Lung Foundation, family members, fundraisers and support group members. The end result is superb and a credit to all the writers involved. ILFA 15 was offically launched during IPF World Week in 2017. Cllick here to read the online version of the ILFA 15 magazine. Irene Byrne, Senior Physiotherapist at the Heart and Lung Transplant Unit at the Mater University Hospital Dublin, discusses exercise, oxygen use and the ILFA 2000 Steps a Day exercise programme. Yvonne Duggan, Senior Dietician at the Heart and Lung Transplant Unit at the Mater Uniersity Hospital Dublin, discusses nutrition and the importance of maintaining a healthy weight for lung fibrosis patients. John Carroll, Lung Fibrosis patient, gives an inspiring account of his successful weight loss and the importance of exercise. Click here to learn more about our 2000 Steps a Day exercise challenge for lung fibrosis patients. If you have been diagnosed with lung fibrosis or idiopathic pulmonary fibrosis (IPF), you may be feeling scared, lost and lonely. You have probably never heard of this condition before. If you would like to meet people who are also diagnosed with lung fibrosis and find out how they are managing their health, why not come along to a support group? There are a number of support groups around the country that meet once a month. All are welcome to attend the meetings. Click here for more details and contact numbers. Patients diagnosed with Lung Fibrosis face many challenges. 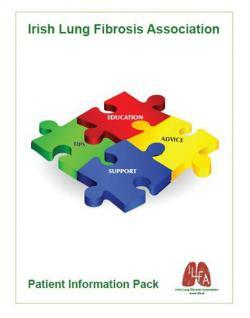 ILFA supports patients and families by providing information about the condition and the services available to them. ILFA aims to increase public awareness about Lung Fibrosis and to educate healthcare professionals about the condition and the needs of patients. We promote and support research into Lung Fibrosis. We hope you find our website useful. If you need further information or if you have any comments regarding our website, we would love to hear from you.